Roni is a 2-year-old lovely boy. 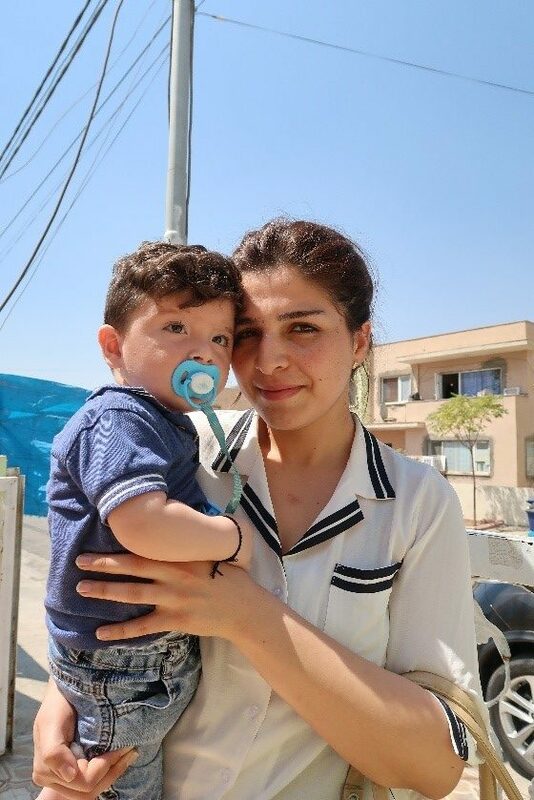 His parents are Syrian refugees, who fled their country in 2014 because of ISIS invasion.Few years after they arrived to Erbil, Roni was born. Unfortunately, probably because of complications during the delivery, Roni’s brain is partly damaged and he is suffering from cerebral palsy. Roni has especially motor problems and can control his movements. He needs lifelong special care. His parents are not giving up on him and they are regularly visiting a physiotherapist to prevent contractions and the atrophy of his muscles. However, it is hard for them to sustain such regular medical expenses. In fact, before displacement, Roni’s father was studying literature and was committed to pursue a career as a literate. However, once they moved to Erbil, even if Roni’s father was educated, he could only find a job as a shop assistant. Our organization started to support Roni last year and with the donation of the French Association for the Aid of Youths with Disabilities and People with Handicaps (Association pour l’Aide aux Jeunes Infirmes et aux Personnes handicapées), was able to continue for an extra year. Especially since August STEP-IN opened a new Physiotherapy Clinic in Ozal so we are definitely able to provide him quality physiotherapy care on a daily basis.